This baked chicken breast recipe has everything. It’s extremely moist, great taste, a little crunchiness. Plus, it is SIMPLE. You can never have enough great chicken breast recipes. 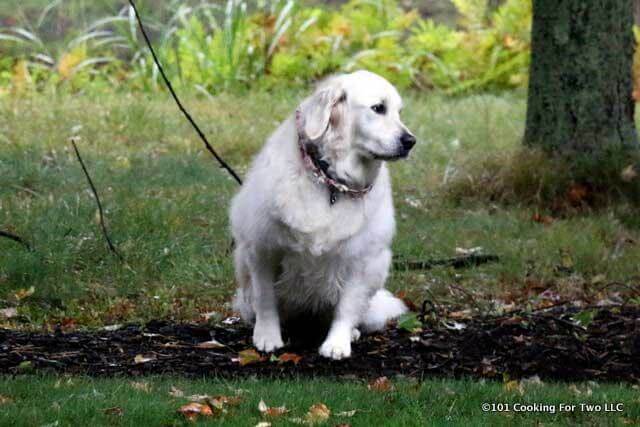 Editors Note:Originally Published December 12, 2012, It has been buried on the blog for a while and needed to see the light of day. The pictures are re-edited. The text is re-written and buffed up. And one modification to technique adding a flip in the middle of cooking. This is a great recipe that has a skill level of 2/10. 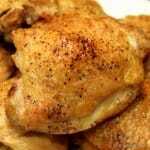 This is a baked skinless boneless chicken recipe using with an easy tasty coating. The “inspired by” for today goes to Melt in Your Mouth Chicken Breast at Food.com. While it is a top rate recipe, I thought it needed a little crunch and some other small touches. But otherwise, a wonderful recipe. The recipe starts with a base of some mayo. Add some Parmesan and seasoning. Coat some well-trimmed skinless boneless chicken breasts. To add crunch sprinkle all sides with some Italian bread crumbs. Bake and you’re in chicken heaven. The wife started chanting 5 and then changed Christmas dinner to this. I think she liked it. And so did I. 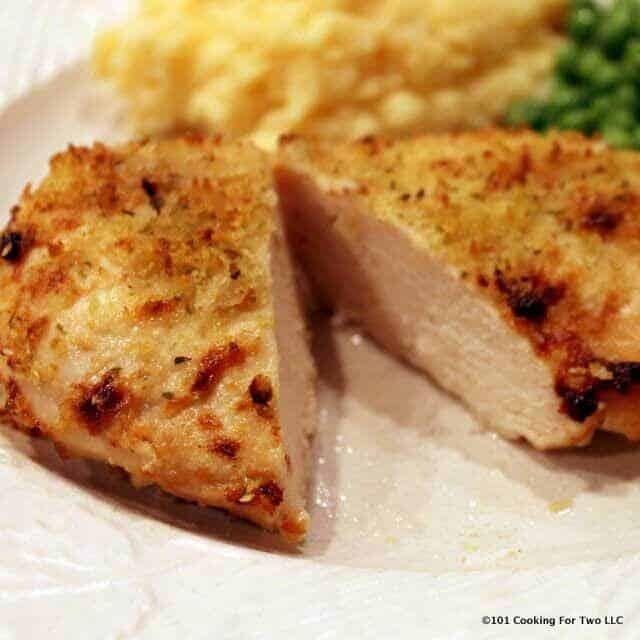 This recipe uses skinless boneless chicken breasts which have “grown” in my lifetime. Once upon a time, we were talking 6-8 oz. Now mostly about 10-12 oz and occasionally a full pound. Try to pick chicken that is all about the same size. The results overall will be better since they will cook more evenly. If you are cooking more than two, larger breast to the outside of the pan helps a lot. I love cooking my chicken on a rack. You really need to get a rack. For a few dollars, you will become a much better cook. But get one that is “oven safe.” Some racks are cooling racks only and have a coating. If your local store does not have them, Amazon will. I list a few in Cooking for Two Shop, but others will work. You need a base and the original recipe calls for mayo. You will see in the comments that even the “mayo haters” love it. You can use a lower fat if you wish. Other similar recipes use yogurt. The yogurt is frequently non-fat. The coat of the mayo should be light. Too much will make the chicken wet. A final note on the mayo. Miracle Whip is NOT mayonnaise. It has some sweetness and multiple other spices. Please do not use it in this recipe. Or at least realize it may convey some tastes. It is always tempting to add more of something you like. I like Panko breadcrumbs. But a LIGHT sprinkle. If you do more, you will have a “Panko Chicken” so let’s be careful. This is an easy recipe to adjust. Cut in half for two or double for a full family. Cut the fat with low-fat mayo or use nonfat Greek yogurt. I’m adding a suggest flip of the chicken halfway through the cooking. Some (not me nor many others) are having problems with a soggy bottom. A couple of possibilities occur to me. First, previously frozen chicken or older chicken can release more fluid. Also, too much or thinner mayo could contribute. Or nothing they did. Either way, the flip should help those cases and won’t hurt. Use a fork for the flip. Tongs may remove some coating. Chicken should not be rinsed for food safety. It will splatter germs over your kitchen. 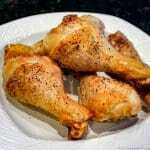 For more details, please see Chicken… To Rinse or Not To Rinse? . Preheat oven to 375 convection or 400 regular oven. 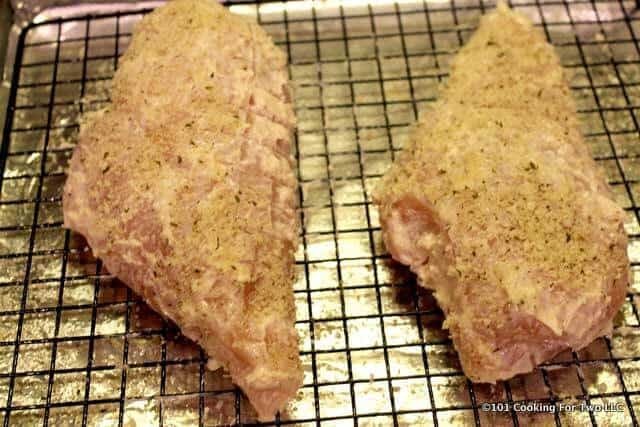 Trim and pat dry 3-4 skinless boneless chicken breasts. Mix in a medium bowl 1 cup mayonnaise, 1/2 cup Parmesan cheese (fresh shredded preferred), 1 1/2 teaspoon seasoning salt (I used Lawry’s), 1 teaspoon garlic powder and 1/2 teaspoon pepper. This is more than you need. 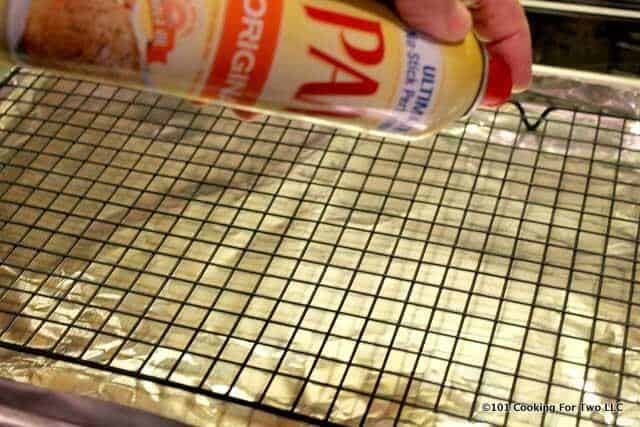 Prepare a cooking sheet with aluminum foil (to help clean up) and a rack. The rack will help crispness all around. You can do without the rack, but the bottom will not be crispy. Give the rack a good spray of PAM. 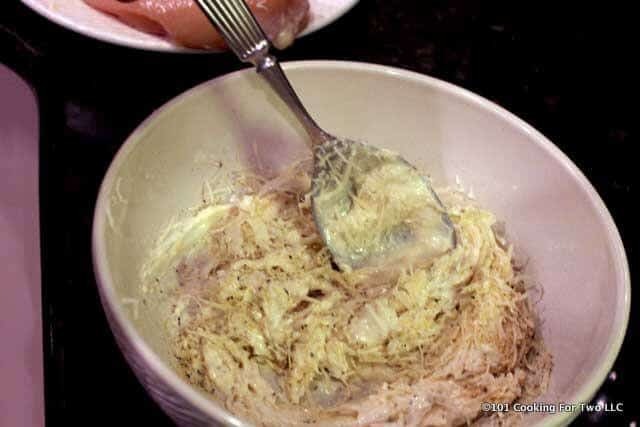 Dip the chicken breasts in the mayonnaise Parmesan mixture. Be sure to get all surface coated. Finger use allowed but be sure to wash well after. Note: keep it light and do not try to use all the coating. Lightly sprinkle with some Italian bread crumbs on both sides. I used about 1/3 cup on three large breasts. You are not coating them. Just adding some crispy and flavor. Bake until internal temp of 165. This will vary by oven but mostly by the size of the chicken breast. At 20 minutes into baking, flip the breasts with a fork. The total cooking time of about 40 minutes for medium to large. 45 minute for huge. Let rest for 5 to 10 minutes before serving. 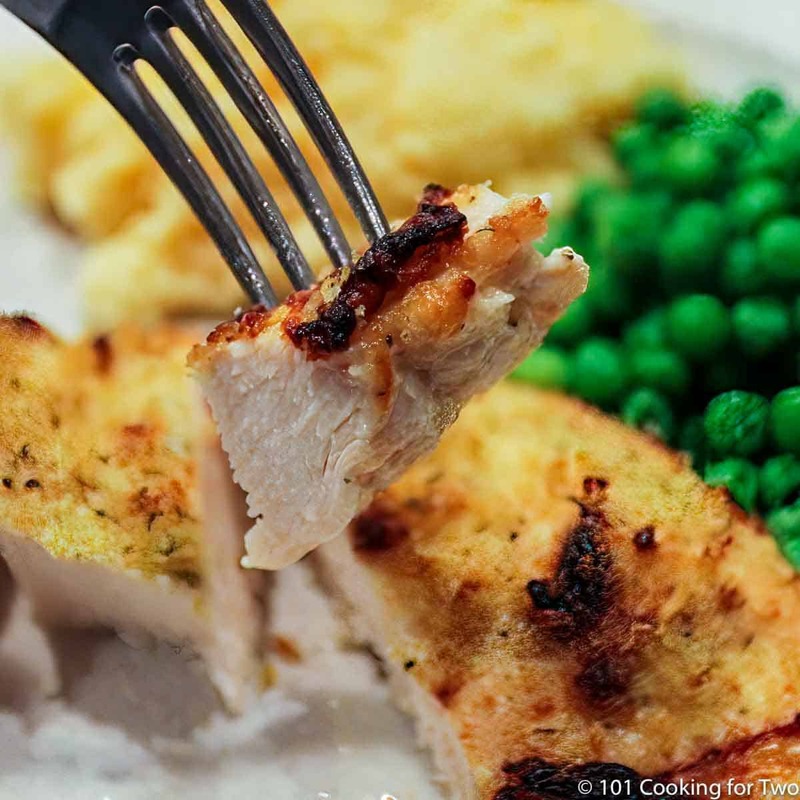 This skinless boneless chicken breast recipe has everything. It's extremely moist with great taste and a little crunchiness. Plus, it is SIMPLE. You can never have enough great chicken breast recipes. Preheat oven to 375 convection or 400 regular oven. Trim and pat dry 3-4 skinless boneless chicken breasts. Get them very dry. Mix in a medium bowl 1 cup mayonnaise, 1/2 cup Parmesan cheese (fresh shredded preferred), 1 1/2 teaspoon seasoning salt (I used Lawry’s), 1 teaspoon garlic powder and 1/2 teaspoon pepper. This will make more than you need. 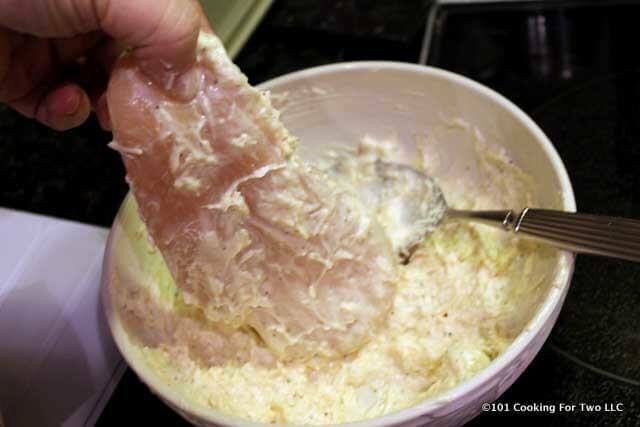 Dip the chicken breasts in the mayonnaise Parmesan mixture. Be sure to get all surface coated. Finger use allowed but be sure to wash well after. KEEP IT LIGHT and do not try to use all the coating. Bake until internal temp of 165. This will vary by oven but mostly by the size of the chicken breast. At 20 minutes into baking, flip the breasts with a fork. Total cooking time of about 40 minutes for medium to large. 45 minute for huge. Let rest for 5 to 10 minutes before serving. Try to use chicken breasts of about the same size. Be sure to pat dry the chicken breasts. Very dry. The coating will stick better. Keep the coating light and bread crumbs light. Do not use all the coating. I added a flip in the middle of the recipes. Some appear to need it. Use a fork please. Not mandatory. Miracle Whip is NOT mayonnaise. It has some sweetness and multiple spices. Obviously an easy recipe to adjust. This turned out great; very juicy and tender. It didn’t have the nice golden brown volir but was pretty much perfect. Thanks. I have two convection ovens. One will brown wonderfully, the other not nearly as good only on the browning. The cooking times are identical and both measure to be accurate on temperature. Guess which one I use for blog pictures. Don’t be afraid to hit something with a bit of broiler if your oven is like my #2. I’m making this tonight! This sounds too easy! I’m trying Asiago/Parmesan/Romano blend, it’s what I had on hand. Hello dan I plan on trying this recipe out tonight. 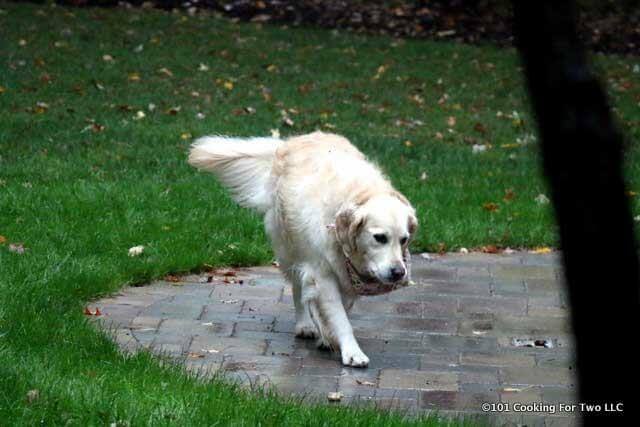 I have everything I need except the Italian bread crumbs. I do have Shake n Bake though, do you think that sprinkling some shake n bake on top would be a good alternative? Thanks in advance dan. I haven’t seen Shake n Bake for years but I believe it is more just fancied up flour for “oven frying” things. So not close to bread crumbs. 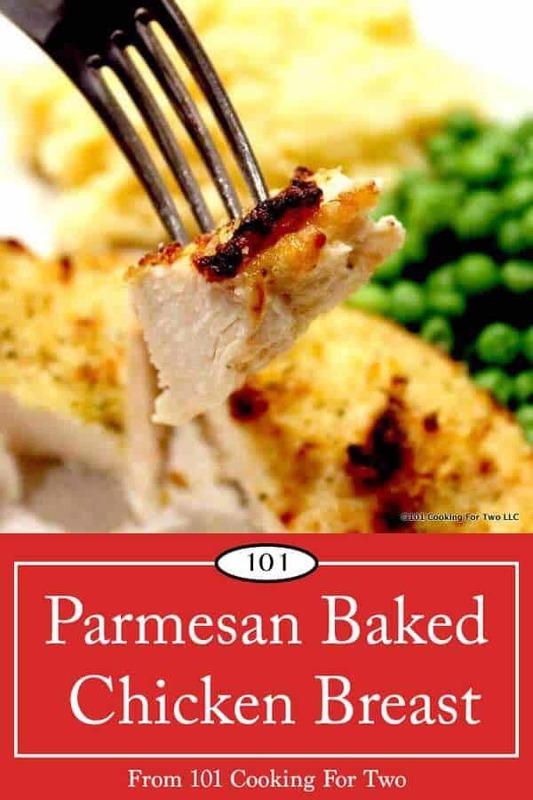 You can use non-Italian Panko bread crumbs or make your own by running a slice of bread through a blender the brown in a little oil over medium-high heat. Thanks so much for posting this unbelievably succulent delicious recipe. I am kind of new to cooking and never would have bought boneless skinless chicken breasts until I noticed all the positive reviews. I wouldn’t change a thing it’s perfect! I’m excited to browse and learn even if it’s trial n error. I will be sure to make this for friends and family. They’ll be so impressed. Thanks for the compliment and glad it worked well for you. Let me know if you have questions of recipe. I have most well documented with step by step photo that help newer cooks. 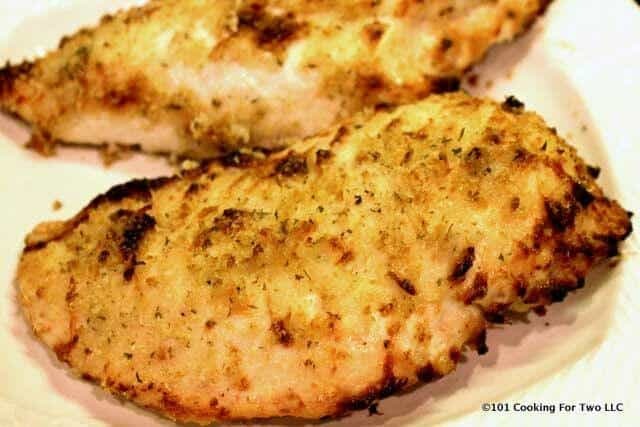 I am not a big fan of chicken breast due to them always being on the dry side, but I bought a pack of chicken breast the other day they were on sale, and figured I would look online to find a recipe to see if I could find a way to cook them that was good. I found this recipe, and decided to give it a try, and OH MY GOSH!!! I absolutely love how this chicken tastes, and the breasts were so juicy and tender, it was life changing in a chicken cooking way. Next time my family has a big get together I’m going to cook and I’m going to make this. my 4 year old is a very picky eater, and when he tasted it he let out a big “mmmm! Its delicious! !” Haha. Thank you so much for this recipe, it is awesome!!!!!! I do love this recipe, simple and reliable. We use it for family meals and semi-special meals. Glad it worked for you and thanks for the note. Hi I was wondering about maybe adding some brown sugar to the mix, just wondering what you think. 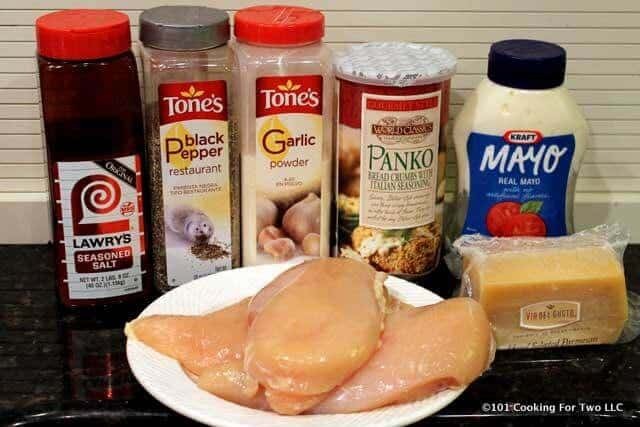 I take 1 breast and slice it into 4-6 smaller pieces, then spread mayo mixture on them, top w/crumbs and bake at 425 for about 15 minutes..I use about 1/2 c. mayo, some cheese, sprinkle of Italian seasoning and garlic powder…mix and spread…delicious..
I’m always in favor of for surface area for flavor. Sounds great. Thanks for the note and variation. I just made this with an additional 1/2 c shredded cheddar because who doesn’t like more cheese! Came out moist and delicious and cant wait to attempt again. I did the flip but will bypass next time as it baked well on the rack. Presentation made me look like a pro. What sidedishes would you pair it with? Nothing specific. 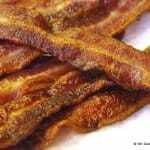 We like the green beans with bacon.https://www.101cookingfortwo.com/baked-bacon-green-beans/ or a side salad.